Connector A: Screw On Male Coax. Sky & Freesat. Freesat Dishes. Freesat LNB. Coaxial Cables. Sky Dishes. Twin Type Cable Clip. High Quality Coaxial Cable. Magic eye TV Links. 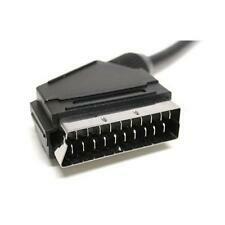 You can also add this lead to the end of your existing cable with an included free coupler. Length: 5m. Supplied with an F-F Barrel connector allowing you to join this cable your existing cable if for example you are moving your box. Colour : White. Cable Type : 75Ohm RG59/U Coaxial. Cable Type : 75Ohm RG59/U Coaxial. Length: 10m. Colour : Black. 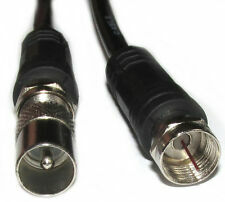 · Connector Type B: TV, Coaxial Plug. Supplied with an F-F Barrel connector allowing you to join this cable your existing cable if for example you are moving your box. Length: 3m. Colour : White. Cable Type : 75Ohm RG59/U Coaxial. Length: 1m. 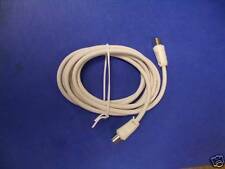 F Type Plug Cables Male to Male. Screw on Gold Plated Moulded Connectors for excellent connections. 75 Ohm low loss cable and moulded-on gold plated ‘F' connectors. Length: 10m. Supplied with an F-F Barrel connector allowing you to join this cable your existing cable if for example you are moving your box. Colour : White. Cable Type : 75Ohm RG59/U Coaxial. Cable Type : 75Ohm RG59/U Coaxial. Length: 1m. Colour : Black. 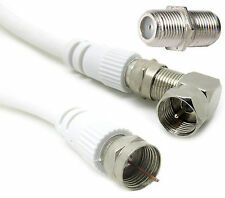 COAX socket R/A TO Female White 1M. Length: 1m. Cable Type : 75Ohm RG59/U Coaxial. Colour : Black. Length: 2m. 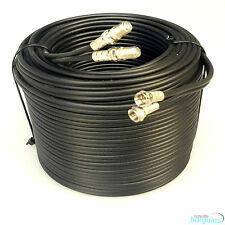 Supplied with an F-F Barrel connector allowing you to join this cable your existing cable if for example you are moving your box. Colour : Black. Cable Type : 75Ohm RG59/U Coaxial. Length: 10m. Supplied with an F-F Barrel connector allowing you to join this cable your existing cable if for example you are moving your box. Colour : Black. Cable Type : 75Ohm RG59/U Coaxial. 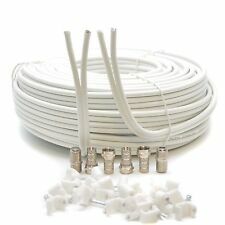 Supplied with an F-F Barrel connector allowing you to join this cable your existing cable if for example you are moving your box. Length: 3m. Colour : Black. Cable Type : 75Ohm RG59/U Coaxial. Length: 15m. Supplied with an F-F Barrel connector allowing you to join this cable your existing cable if for example you are moving your box. Colour : White. Cable Type : 75Ohm RG59/U Coaxial. High Grade Twin shotgun digital coaxial cable. 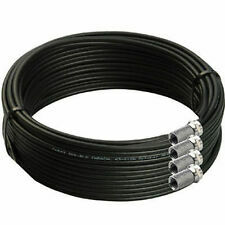 Black Twin Shotgun Coax Cable. Extending a existing feed. Replacing a faulty feed. Cable Type : 75Ohm RG59/U Coaxial. Length: 1m. Colour : White. Cable Type : 75Ohm RG59/U Coaxial. Length: 10m. Colour : White. Large easy-tighten nut on Male F-Connector. For "100" size coax cable such as WF100, WC100 and CT100. WF65CU Twin/ Shotgun Cable. 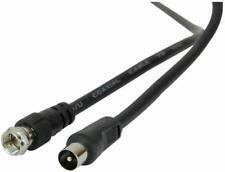 Suitable for these cable types Over Plug Length: 17.5mm. Any Double Screened 90dB and 100dB cable. Cable Type : 75Ohm RG59/U Coaxial. Length: 3m. Colour : White. Supplied with an F-F Barrel connector allowing you to join this cable your existing cable if for example you are moving your box. Colour : White. Cable Type : 75Ohm RG59/U Coaxial. Length: 2m. Supplied with an F-F Barrel connector allowing you to join this cable your existing cable if for example you are moving your box. Colour : White. Cable Type : 75Ohm RG59/U Coaxial. Can also be used to connect between tv aerial connections where an F-type socket is used. 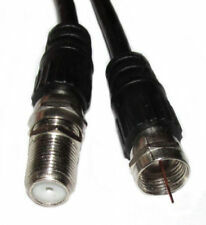 Cable Type: Screened Coaxial. Length, Lead: 1m / 3.28ft. 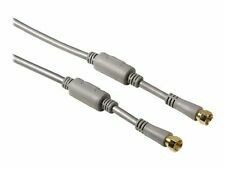 These leads incorporate 75Ω low loss cable, and moulded-on gold plated ‘F' connectors for Optimum Signal transfer. 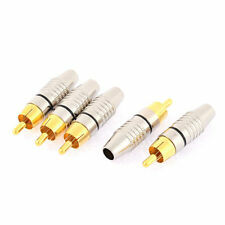 High Grade Twin shotgun digital coaxial cable. 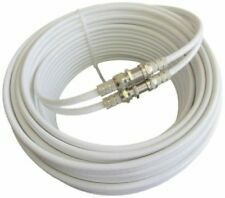 White Twin Shotgun Coax Cable. Extending a existing feed. Replacing a faulty feed. Coax F Screw Plug to Plug. 75 ohm Cable with Screw on Connectors. WHITE SKY / VIRGIN CABLE. SKY SAT, VIRGIN, FREEVIEW BOX, BLADE, VU . 1 x F Type Plug to 1 x F Type Plug. Supplied with an F-F Barrel connector allowing you to join this cable your existing cable if for example you are moving your box. Colour : Black. 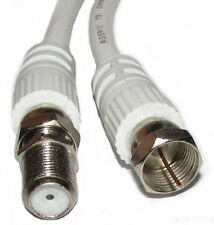 Cable Type : 75Ohm RG59/U Coaxial.